Under the allowance method, if a specific customer's accounts receivable is identified as uncollectible, it is written off by removing the amount from Accounts Receivable. The entry to write off a bad account affects only balance sheet accounts: a debit to Allowance for Doubtful Accounts and a credit to Accounts Receivable. No expense or loss is reported on the income statement because this write-off is "covered" under the earlier adjusting entries for estimated bad debts expense. Let's illustrate the write-off with the following example. On June 3, a customer purchases $1,400 of goods on credit from Gem Merchandise Co. On August 24, that same customer informs Gem Merchandise Co. that it has filed for bankruptcy. The customer states that its bank has a lien on all of its assets. It also states that the liquidation value of those assets is less than the amount it owes the bank, and as a result Gem will receive nothing toward its $1,400 accounts receivable. After confirming this information, Gem concludes that it should remove, or write off, the customer's account balance of $1,400. Note that prior to the August 24 entry of $1,400 to write off the uncollectible amount, the net realizable value of the accounts receivables was $230,000 ($240,000 debit balance in Accounts Receivable and $10,000 credit balance in Allowance for Doubtful Accounts). 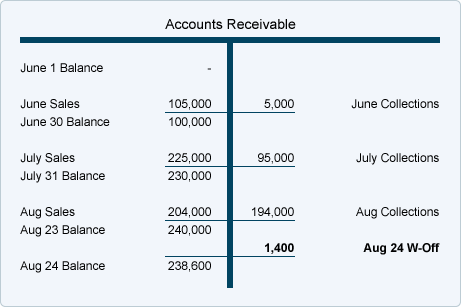 After writing off the bad account on August 24, the net realizable value of the accounts receivable is still $230,000 ($238,600 debit balance in Accounts Receivable and $8,600 credit balance in Allowance for Doubtful Accounts). The Bad Debts Expense remains at $10,000; it is not directly affected by the journal entry write-off. The bad debts expense recorded on June 30 and July 31 had anticipated a credit loss such as this. It would be double counting for Gem to record both an anticipated estimate of a credit loss and the actual credit loss. The seller's accounting records now show that the account receivable was paid, making it more likely that the seller might do future business with this customer. Another way sellers apply the allowance method of recording bad debts expense is by using the percentage of credit sales approach. 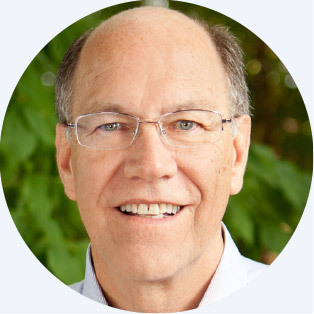 This approach automatically expenses a percentage of its credit sales based on past history. 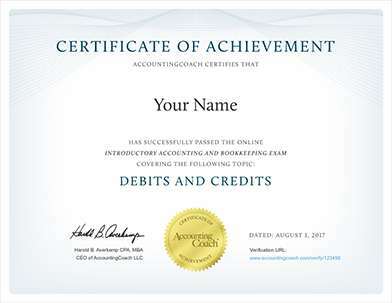 The percentage of credit sales approach focuses on the income statement and the matching principle. Sales revenues of $500,000 are immediately matched with $1,500 of bad debts expense. 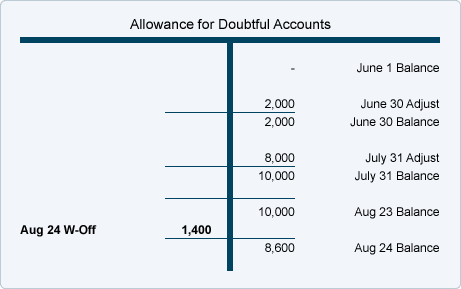 The balance in the account Allowance for Doubtful Accounts is ignored at the time of the weekly entries. However, at some later date, the balance in the allowance account must be reviewed and perhaps further adjusted, so that the balance sheet will report the correct net realizable value. If the seller is a new company, it might calculate its bad debts expense by using an industry average until it develops its own experience rate.